A few years ago, I drove across the Mojave Desert for the first time and never forgot its severe and peculiar beauty. Since then, I often thought of going back for a visit, but I couldn't imagine precisely where I would go or what I would do once I got there. The only thing I knew for sure was that I wanted to see more detail than I had seen through a windshield. This was my first bicycle tour and I really had to work up to the idea of doing it. I use a bicycle as my primary means of transportation on a daily basis, but it was hard at first to imagine being alone on my bike so far from home for an extended period of time. 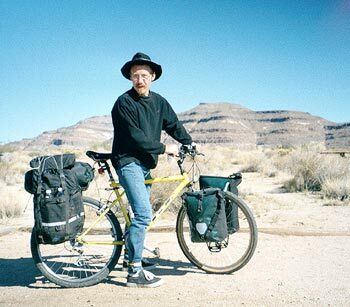 Eventually I made it past that self-imposed limitation and realized that a bike would be a great way to explore the desert. After a bit of study, I chose the Mojave National Preserve over other desert locales as my destination. The dramatic desert landscapes include both flatter lands and mountains and the vegetation ranges from desert scrub to joshua trees to pinyon-and-juniper forests, depending on the specific area. The roads carry minimal traffic and it's not much of a tourist destination (yet), two factors which contribute to enjoyable cycling conditions. I wouldn't tour the Mojave National Preserve in the scorching-hot summer months, but the weather in early November, 1999 turned out to be perfectblue skies each day, daytime temperatures in the 60-70°F (15-20°C) range, and 37-55°F (2-12°C) at night. The air was dry and comfortable and I happily did not get rained on. The only thing I could have asked for was some moonlight on one dark night that I found myself riding a dirt road alone in total darkness. I didn't know anyone else interested in doing this kind of trip, so I did this tour solo. Some planning is required to gain familiarity with the area before going. 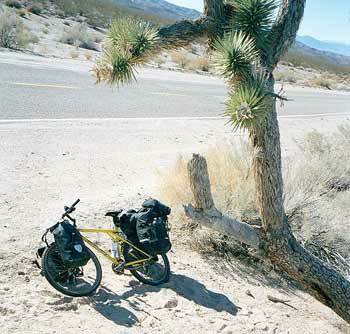 There are hardly any servicesstores, water, accomodationsin the Mojave National Preserve, so the location of what little is available will dictate many aspects of a bicycle trip there. Water, food and sleep are needed on a frequent basis! As I analyzed the situation, camping proved to be the only option. This meant that I would need to carry a tent, sleeping bag and other supplies, which in turn obligated me to deck my bike with racks and panniers. Finding a front rack that would fit my mountain bike turned out to be a little more difficult than I expected. I ended up mail-ordering one at the last minute from Old Man Mountain. A few main, paved roads traverse the Preserve and these are in good condition. 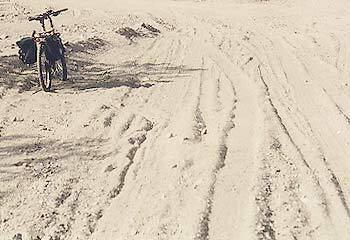 Dirt roads form the rest of the road network, but these tend to be washboarded and sandy on the surface. The best of these are the "maintained" dirt roads, which although fine for cars, can still be pretty rough and sandy in places for a cyclista mountain bike is pretty much required out here. With perseverence, most of the remote dirt roads that criss-cross the Preserve could probably be navigated with a fully loaded mountain bike, but it would make for slow, energy-consuming riding. Still, the unforgettable backcountry experience would be more than worth the trouble if the trip has been planned properly. The best itinerary would reserve the poorest riding surfaces for downhill segments. There are a lot of hills to be reckoned with, some of them quite long, but most of them are reasonably gradual (at least compared to some of the steeper mountain roads I'm used to in the San Jose area...). The areas I toured ranged from 925 feet to 5600 feet elevation.